This is an article I wrote for the Wild West Shootout 2017 event program about Bishop Manogue High School. The Wild West Shootout is a basketball competition among eight high schools, mainly in the western part of the United States and is held in Reno, Nevada. It raises awareness and funds for the Sierra Kids Foundation, which provides help for children with autism and their families. They are tied into the University of Nevada, Reno’s autism program. My first grandson is on the spectrum, so I’m very grateful for what they do. Sorry it has been so long between blogs. A lot has happened, but I’m alive. Enjoy the article. Enjoy life. © Paul George and The Reno Signal, 2018. Unauthorized use and/or duplication of this material without express and written permission from this blog’s author and/or owner is strictly prohibited. Excerpts and links may be used, provided that full and clear credit is given to Paul George and The Reno Signal with appropriate and specific direction to the original content. 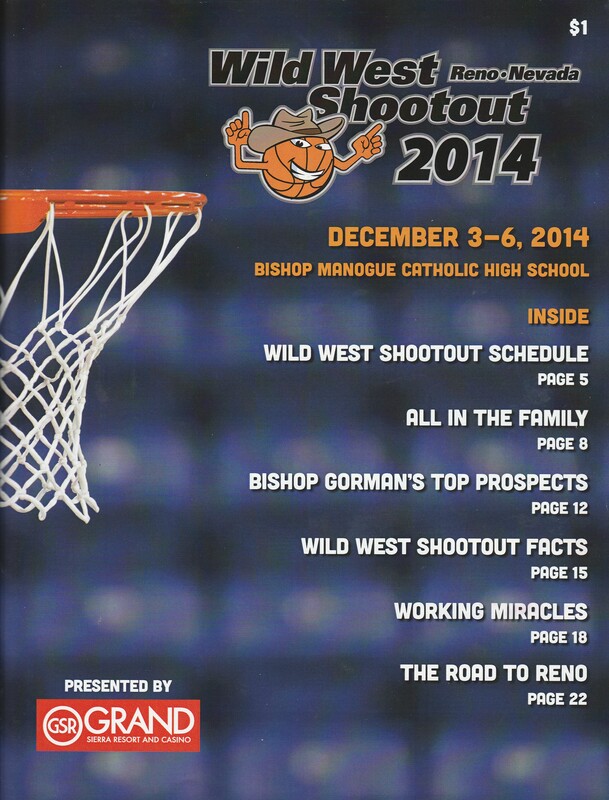 The Wild West Shootout was held the first week of December in Reno, Nevada. The competition is held to raise funds and support for the Sierra Kids Foundation, which raises funds to help low-income families dealing with the challenges of having an young autistic child. The 2014 Shootout made nearly $14,000 for this cause. High School teams from Nevada, Arizona, and California came to participate in the event. For the third year in a row, Jax Marketing’s Jackie Shelton asked me to write an article for the event’s program. I happily accepted the assignment, which was a challenge because I now live in Massachusetts. But also because, just as I started the assignment, I received news that my grandson Darius, 2, had just been diagnosed with autism. While this did not affect my article, it did make me stop and think a little more about the SKF and what it does. “The Road to Reno” is a two-page article about the schools that came to Reno from other cities. I also wrote a second piece “Wild West Shootout Facts,” which collects interesting facts about the schools involved. © Paul Anthony George and The Reno Signal, 2014. Unauthorized use and/or duplication of this material without express and written permission from this blog’s author and/or owner is strictly prohibited. Excerpts and links may be used, provided that full and clear credit is given to Paul Anthony George and The Reno Signal with appropriate and specific direction to the original content.